I think that "shackled to a suicide bomber" is more apt. Trump is not only going to lose big in this election to an incredibly weak Democratic candidate, but he is also going to kill the Republicans in the House and Senate and any number of down-ballot elections. Oops. At this point the election is not decided but Trump is clearly competitive and the Republicans look likely to hold on to both houses of Congress. In business school, there is a famous project we do in marketing that teaches an important lesson. In that project, a bunch of Ivy Leaguers are asked to estimate the percentage of people in the US who snow ski. We all look around the table and say, "I ski and you ski and she skis, so it must be about 80%", when in fact the percentage is in the single digits. The lesson is to not make predictions for whole markets (and countries) based on one's own personal outlook and experience. I and many other clearly did not understand large swathes of the electorate, something I want to think about for a bit. The one thing I am sure about is that my (and many others') attempt to apply a policy framework to this is simply not going to work. Trump is a sort of anti-wonk, a governmental Loki. Policy choices likely don't explain this election. Apparently Snuggles is concerned with the mass migration of chihuahuas into this country. As an aside, I find the mindless selection of candidates based on which one seems to be offering the best treat to be an apt metaphor for modern American democracy. Does My Generation Have More Tolerance for Spouses Who Don't Agree Politically? Coming out of voting today, I met two different couples who I know who both said the same thing to me: "we cancelled each other out". Meaning, I think, that the husband and wife voted differently in key elections. I know this is also true of my wife and I. Which leads me to wonder if there is a generational difference in toleration for spouses with different political views, or if (as is often the case) nothing is really changing on this and the examples given in the media of intolerant millennials who won't socialize with people who don't pass various political litmus tests are just that, isolated examples. 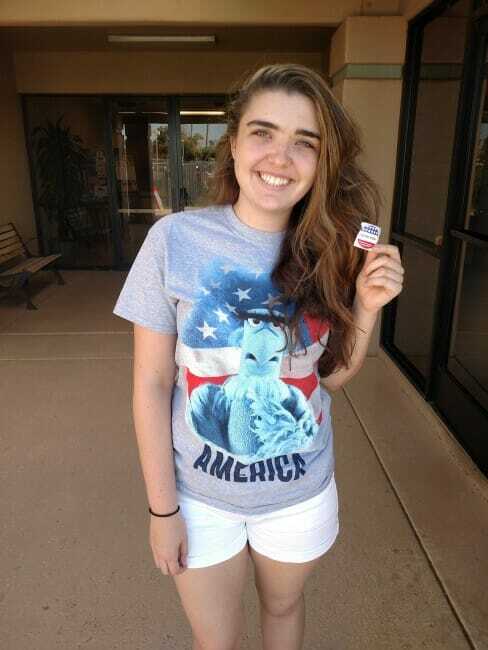 Speaking of which, I took my daughter to vote for the first time today. She was pretty excited, and planned her outfit in advance. She asked me why I was not wearing my "I voted" sticker. I told her that it made me feel like a sucker. She told me that she had clearly come to vote her first time with the wrong person, and should have found a doe-eyed idealist.